At a time of year characteristic for intense and relentless heat – last month in Milan we had a couple of weeks with temperatures reaching 34°C every day – it comes as no surprise to discover that Renaissance architects had experimented with fountains to delight the owners and guests of large villas both inside and outside Milan. 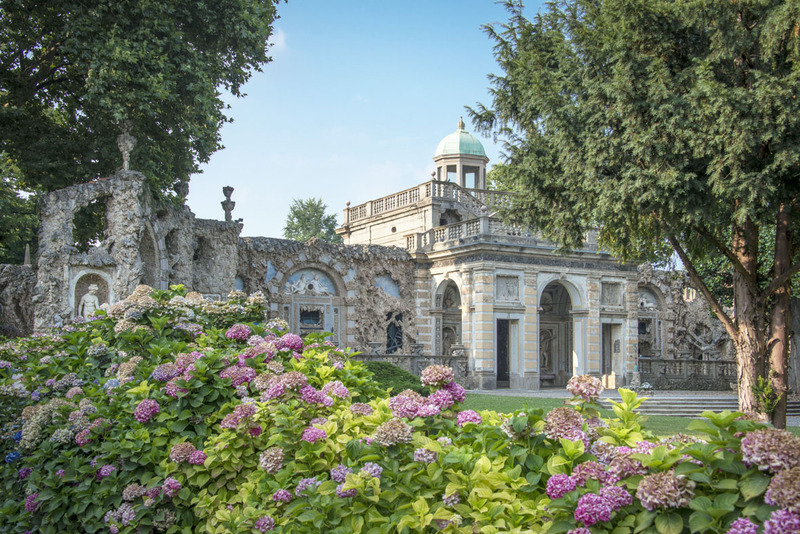 Villa Litta in Lainate, 16 km north-west of Milan, provides one of the best examples in Europe. to escape an accurately directed squirt of water. Pirro I’s work on the villa can be dated to about 1585. He was part of the Borromeo family that gave Milan one of its most celebrated saints, San Carlo, during the rigours of the Counter- Reformation. Pirro himself contributed to Milan’s religious affairs by working with the Fabbrica del Duomo, the company, founded in 1386, that built the Cathedral and now maintains it. This gave him the opportunity to meet the greatest artists, architects and sculptors of his day, and he gave them more light-hearted commissions at his villa. Painter Camillo Procaccini is best-known for his rather dour and solemn compositions of saints and martyrs, but at Lainate he revealed a totally different personality, creating paintings in which angels and clouds morph mysteriously into impish and devilish figures. He also worked using pebbles as his medium, in the fashion of the day known as “grottesco,” used to decorate the interiors of artificial grottos in the garden. 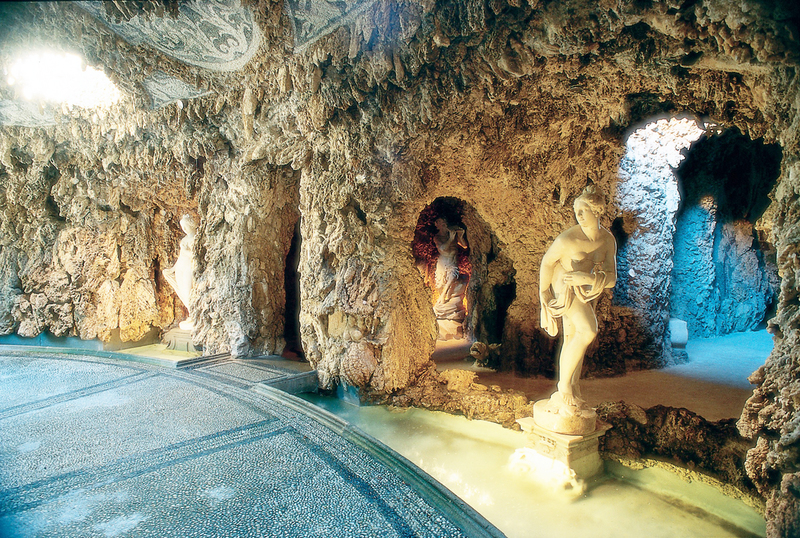 The finest part of the garden is the Nimphaeum, built in travertine to a design that is both symmetrical, with the octagonal “Atrio dei Quattro Venti”, and irregular, forming a maze of grottos with mosaic and pebble decoration, along with statues of Ancient Roman gods. It is here that Pirro invited his aristocratic guests to stroll, in the midst of hidden machinery that could be controlled at a distance so that water jets would appear as if by magic exactly when someone was in the right spot. During guided tours, these mechanisms are activated just as they were four centuries ago. When the guide says something like “Hey, you should be careful if you sit on that step,” his concealed assistant takes the hint and pulls the lever. In one room of the Nimphaeum, called the Rain Court, water was sprinkled from the ceiling in order to simulate rain and produce rainbows. All this – in total there are 53 water-squirting mechanisms – is powered by the pressure generated by a storage tank about twenty metres above ground level, in the “Torre dell’Acqua” that can be seen from the Nimphaeum. There is no doubt that Pirro I wanted to create something on the lines of villas that he had seen elsewhere in Italy, notably the Medici villas outside Florence. However there are also connections with a semisecret organization amongst late Renaissance artists known as the “Accademia dei Facchini della Val di Blenio”. The group was dedicated to the lighter side of life and all the pleasures that life has to offer, as well as to the more mysterious aspects of magic and the esoteric crafts. He must have been an interesting and multifaceted man, and a great organizer of parties! Villa Litta is closed on Mondays. – from Tuesday to Friday at 16.00. – on Saturdays, visits starts each 15 minutes from 15.00 to 16.30; then at 21.15 and 22.00. – Sunday and holidays visits start each 15 minutes from 15.00 to 18.00. Guided visits to the antique palaces. Free unguided tours to the palaces. – Sunday and holidays from 15.00 to 17.00.
children under 5 and disabled free. To get to Lainate, the best way is to take a car. By public transport go to Lampugnano M1 Red Line and take the direct bus to Lainate line Z617. and NOT Linate aiport! You wouldn’t be the first to have that happen!